Andrea: She hates me Nigel. Nigel: And that's my problem because... Oh wait. No, it's not my problem. Andrea: I don't know what else I can do because if I do something right, it's unacknowledged. She doesn't even say thank you. But if I do something wrong, she is vicious. Nigel: I can get another girl to take your job in five minutes. One who really wants it. Andrea: No, I don't want to quit. That's not fair. But, I, you know, I'm just saying that I would just like a little credit for the fact that I'm killing myself trying. Nigel: Andy, be serious. You are not trying. You are whining. What is it that you want me to say to you huh? Do you want me to say, "Poor you. Miranda's picking on you. Poor you. Poor Andy"? Hmm? Wake up, six. She's just doing her job. Don't you know that you are working at the place that published some of the greatest artists of the century? Halston, Lagerfeld, de la Renta. And what they did, what they created was greater than art because you live your life in it. Well, not you, obviously, but some people. You think this is just a magazine, hmm? This is not just a magazine. This is a shining beacon of hope for... oh, I don't know... let's say a young boy growing up in Rhode Island with six brothers pretending to go to soccer practice when he was really going to sewing class and reading Runway under the covers at night with a flashlight. You have no idea how many legends have walked these halls. And what's worse, you don't care. Because this place, where so many people would die to work, you only deign to work. And you want to know why she doesn't kiss you on the forehead and give you a gold star on your homework at the end of the day. Wake up sweetheart. You know something is very wrong in your life when work takes precedence over your cat's well being. The cat or animal lovers would agree with what I just said, but those who don't think much of animals or pets will think I'm crazy. My cat was really sick yesterday and I had to bring him to the vet. After some blood tests, the vet was very concerned as said they will do more tests to check if my cat has leukemia or diabetes as well. Then they asked me if I could bring my cat in the next day for an ultra sound. My response: "I can't. I have to work tomorrow." If my cat were human, concerned citizens would berate me and scream neglect and call child protective services. Now, you may argue this: "It's just a cat!" Well, my cat has been a part of my family for 8 long years, he is not an it, he is a living and breathing being that I love no matter how troublesome he is going to be when he gets older and weaker. This situation brings me to this movie The Devil Wears Prada. How busy and stressed out does one have to be before realising that something is wrong with your priorities? With Anne Hathaway's character Andrea Sachs, she gives up so much for the job that it starts to change her without her even realising it. Are you like that as well? Do we put so much focus on working and earning our keep that we neglect the things that truly matter? Like love, family, friends, and integrity? Sometimes we don't see how much we've changed because of our jobs, but when we do finally realise the truth, the important thing is what you will do about it. Andrea chose to walk away when she can. Me, the verdict's still out, I am not sure if I can or if I want to walk away. I don't think I am at the extreme end yet, but when I do get there, I hope I will be able to screech to a halt and do the right thing for myself. The film's wonderful fashions and glamorous setting makes it very easy on the eyes. But that is just the outer layer of the film. The inner message is what hits home for me. That we all need to slow down and reflect on our lives and what is truly important in our lives. 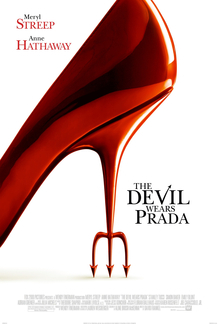 The Devil Wears Prada hit a home run with the casting of the film and was blessed with a fantastic group of actors and actresses that made the movie truly amazing. It was this film that I noticed the lovely Emily Blunt who blew me away as the Emily Carlton. Meryl Streep was awesome as always and was able to make me empathise with her character, Miranda Priestly, despite her manipulative and demanding ways. Stanley Tucci and Anne Hathaway blew me away in the roles they played in the film. And even Adrian Grenier and Simon Baker who both only had minor roles in the film caught my eye with the portrayal of their characters. Now I've argued that we should focus on the things that are truly important in our lives, like family and friends, love and relationships, I think that this film also asks your this fundamental question - How much do you love your job? So ask yourself this question. Do you love your job? To what lengths will you go to achieve what you set out to achieve? Are you Emily Carlton or Andrea Sachs? Once you've figured out which character you are from The Devil Wears Prada, then you know what to do next. (1) Director David Frankel has directed films like Marley & Me (2008) and The Big Year (2011). (3) Anne Hathaway has acted in films like The Princess Diaries (2001), The Other Side Of Heaven (2001), Nicholas Nickleby (2002), Ella Enchanted (2004), The Princess Diaries 2: Royal Engagement (2004), Havoc (2005), Brokeback Mountain (2005), Becoming Jane (2007), Get Smart (2008), Rachel Getting Married (2008), Bride Wars (2009), Valentine's Day (2010), Alice In Wonderland (2010), Love And Other Drugs (2010), One Day (2011), The Dark Knight Rises (2012), and Les Misérables (2012). She's also voiced the characters of Red Puckett in the animation Hoodwinked! (2005), and Jewel in Rio (2011). (4) Emily Blunt has acted in films like The Jane Austen Book Club (2007), Dan In Real Life (2007), Charlie Wilson's War (2007), Sunshine Cleaning (2008), The Young Victoria (2009), The Wolfman (2010), Gulliver's Travels (2010), the Adjustment Bureau (2011), The Muppets (2011), Salmon Fishing In The Yemen (2012), The Five-Year Engagement (2012), and Looper (2012). She has also voiced the character of Juliet in Gnomeo & Juliet (2010). (6) Adrian Grenier has acted in films like Drive Me Crazy (1999), Hart's War (2002), and Anything Else (2003). However, he is well known for his role as Vincent Chase in the television series Entourage (2004-2011). (7) Simon Baker has acted in films like L.A. Confidential (1997), Something New (2006), Women In Trouble (2009), and Margin Call (2011). He is well known for his role as Patrick Jane in The Mentalist (2008-present).